Webb Ellis had a convincing 9-1 victory against the Holly Bush in which Jamie Fox hit five and Lloyd Senna a hat-trick. Chirs Oldham added a single. Alan Worgacz hit a brace for Hillmorton but it wasn’t enough as Lewis Halcrow, Dawa Jallow and Adam Neale all found the net to give CRC Reserves a 3-2 win. The Barley Mow are going from strength to strength after a very good 5-0 win against the Royal Oak. Lee Golding hit a pair and Craig Burrin, Ashley Marks and Chris Loveridge added singles. 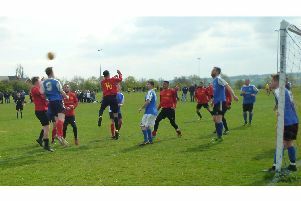 Bourton & Frankton and Braunston shared the points in a 3-3 draw. Mark Whitely (2) and Chev Wrighton scored the goals for Bourton & Frankton. Liam Evans, Connor Slazberg and Adam Bosanko replied for Braunston who, after 11 games, picked up their first point of the season. Lawford, who were in the Birmingham County Cup, progressed to the next round after a very tough 3-2 win against Coventry side Wallace. Lee Thomas hit all the Lawford goals. Games off Lawford v Courthouse and CRC v Caldecott.